The Plaintiffs have been waiting for a final decision from federal Judge Charles Lovell on the merits of their lawsuit since September. Their main contentions are that the Forest Service is legally obligated to allow bison to inhabit the Gallatin National Forest outside Yellowstone National Park, that bison management is based on politics and not science, and that repeated slaughters of substantial portions of the bison population threaten its genetic integrity. Plaintiffs are asking the court to enjoin or restrain the agencies from lethal removal of bison in and around Yellowstone National Park, as well as the continuing use of capture facilities like the one at Stephens Creek to capture bison for the purpose of either confining them for extended periods or processing them before shipping them off to slaughter-houses. According to one of the Plaintiffs’ experts, long-time Gallatin area resident Glenn Hockett, “The alternative to slaughter that they’ve ignored is habitat.” If freed from the trap and allowed to access their winter range, according to Hockett, bison would pose little or no real problem. “There is no good reason to slaughter these magnificent creatures when substantial conflict-free winter range habitat is available to these bison outside the Park at this time both on public and private land,” Hockett, a professional range ecologist and Volunteer President of Gallatin Wildlife Association said. Hockett informed the court that “thousands of acres of cattle-free, critical winter range habitat is available to bison in the direction the trapped bison are migrating towards on both public and private land, near Dome Mountain,” including more than 5,000 acres on the Gallatin National Forest, 5,000 acres on the bison-tolerant Dome Mountain Ranch, and nearly 5,000 acres in the Dome Mountain Wildlife Management Area. Hockett also informed the court that the only two ranchers with cattle in the area this time of year, Hank Rate and Bill Hoppe, are not opposed to free-roaming bison. “Who exactly are the agencies serving by repeating the senseless slaughter of 2008?” Hockett asks. Attorneys for the federal agencies have indicated to Plaintiffs that they will file a response on Monday, and the Court is expected to rule promptly thereafter. Should Judge Lovell deny their request, Plaintiffs have the option of proceeding immediately to the Circuit Court of Appeals for emergency relief. The Yellowstone bison population includes America’s last continuously wild herds, and is the last population that still follows its migratory instincts. As unique native herbivores that evolved across the North American continent, scientists believe bison can help restore the native grasslands, sagebrush steppes, and prairie ecosystems that are considered to be some of the most endangered habitats in the world. WESTERN WATERSHEDS PROJECT is a regional, membership, not-for-profit conservation organization, dedicated to protecting and conserving the public lands and natural resources of watersheds in the American West. WWP has its headquarters at the Greenfire Preserve in Custer County, Idaho; and is supported by more than 1,400 members located throughout the United States, including in Montana. WWP’s Montana office is in Missoula, and it also has offices and other staff in Boise, Hailey, and Salmon, Idaho, Wyoming, Utah, Arizona, and California. Through these staff, and with the assistance of numerous unpaid members and supporters, WWP is deeply involved in seeking to improve livestock grazing management on federal and state public lands, including on the federal lands at issue in this case. WWP is also involved in seeking to protect native wildlife and their habitat across the west, including bison and sage grouse. NATIVE ECOSYSTEMS COUNCIL is a non-profit Montana corporation with its principal place of business at Willow Creek, Gallatin County. Native Ecosystems Council is dedicated to the conservation of natural resources and the preservation of the Gallatin National Forest. NEC has participated extensively in administrative actions to protect these forests from environmentally damaging plans and activities, and to protect native wildlife and their habitat. Thanks, Ken, for quickly posting this. Those of us in the field here don’t have email access, and it helps to read this before we head back. Am I reading this correctly that they won’t rule until Monday? That means they could ship to slaughter before then? No, it just means that the agencies will file their briefs by Monday. I’m not sure, but I don’t think that the agencies can take any action beforehand. I don’t want to sound naive, but another one of the “not good” animals. I’ve been aware of brucellosis for some time, and I know what it can do, but perhaps someone can enlighten me on why the bison might have to go when, and here the correction is welcome, elk have had brucellosis, and actually mingled about livestock? And, I would assume that if a bison carried the antibodies for brucellosis, and not actually have the disease that that would be good. Thanks! I knew I saw that somewhere, but I’m on a bit of overlosd with what I must do, and other things I find both interesting and important. I am trying to get as many people as I can to write to Frontline at PBS to get them to do an investigative news story about the bison situation. Best long term solution is to either buy out the leases around the Park, or buy the land. Ranchers are never going to stop spreading the “boogey-bison” myths while continuing to ignore the documented source of danger to their herds-elk. I hope the judge has some spine and issues it, but I don’t think he or she will. I would prefer that all the money spent researching wildlife to death be spent on land acquisition. There are many small ranches surrounded by public lands in the west that create lots of problems for wildlife. When a Bison steps on their land they want it removed. If a Wolf chases one of their cows they call Wildlife Services. If an Elk eats their hay, they shoot it and eat it. Buying them out and retiring their range permits would help solve some of these problems. What wildlife is researched to death? Many of the collared wolves in yellowstone live for a very long time for wild wolves (21, 302 and 113 come to mind). You should take a course in photoshop if the collars affect your wildlife photo business and bother you that much. Didn’t National Wildlife Federation along with support from some other conservation groups buyout the grazing leases on public lands in this area a few years ago? Schweitzer’s office said they are working on amending a bill. I expressed my concerns and intimated that there seems to be a lack of leadership from his office regarding the bison issue. They are taking people’s names and addresses so people should call and keep calling. At the risk of being redundant, if the Turner deal had been allowed to work its way through, the original group of animals would be safely reproducing by now, saving genetic material, and there would have been some big money pressure being brought to bear on saving some of these animals now. Instead, this situation is now getting worse and worse. It looks like the DOL is out to butcher a big bunch of them and I wouldn’t be surprised if the Turner crew, burned by their last effort to intervene, takes their money and their lawyers and their lobbying clout and stays out of it. I’ve watched people stand on principle all my life, heard them talk the talk. I’m now an advocate of looking toward the outcome; but, good luck with overturning the DOl, the ranchers, and the bison plan they’re hiding behind for long without big money, big money lawyers, and big money lobbying clout. …and that’s how it has always been. We owe our remaining environmental heritage to guys like Mather, Grinnell, Roosevelt, Sheldon, Dorr, Rockefeller, and now Turner. We may be jealous of them and their money; I’m an unabashed leftist myself; but, when they step up to do the right thing, then we ought to have sense enough to let them, in fact help them, to use their power when we need it. Again and as I’ve opined before, free-ranging bison would be great; but, for lack of a better alternative that can and will actually be implemented in the foreseeable future, the Turner deal was better than this slide toward dead bison, at least in my opinion and under these circumstances. At least, we’d have some live bison up at Spanish Peaks to argue about later. There has been no resolution of the Turner deal. At this point Turner is holding the bison as they had originally planned. This has nothing to do with the Turner deal. It seems like we are indeed headed toward a slaughter the likes we haven’t seen since 2008. I don’t have great faith that the legal system will rule on behalf of the bison, creating the likelyhood that this injunction will simply delay the inevitable! What are the chances land could be purchased or leased? Again, at the heart of this issue is the uneducated assumptions concerning bison, brucellosis, and Montana cattle. THANK YOU to everyone working on this. I speak for many flatlanders on this. I second that Mike. We need to protect the bison from slaughter. We’re approaching eminent domain time. The preservation of an iconic species is more important than a few ranches. It is to some (us included), but unfortunately its not important enought for government officials in Montana and at the Federal level. I agree with an earlier sentiment (William) to continue sending Governor Schweitzer’s office and other elected leaders phone calls and emails. Those of use who care deeply about protecting these bison NEED the help of decision makers in Montana and the US Government. I stopped eating beef in 1995. My decision had nothing to do with health. This kind of thing just screams the point. The whole thing is disgusting. My wife and I quit eating beef four years ago, and although it wasn’t for health reasons, either, health is definitely a good side benefit. And, we don’t miss eating beef one bit. Yes, I stopped eating beef over 30 years ago and not for health either. Thank you to all those filing this lawsuit. Seeing these Bison just trying to survive, then getting slaughtered for it, breaks my heart. It saddens me that Montana’s priorities are so upside down. Kudos john. I stopped eating the damn things in 1999. My arteries thank me each time I go to the Dr. I enjoyed beef for a large part of my life, but when I realized what the sacred cow was doing to my wild spaces and the control they had over wild things, I gave it up. No beef, pork or lamb in our house for 34 years for lots of reasons. It’s sad that these animals might be slaughtered to supposedly protect non native cattle. Only in America (in other places as well) does native wildlife get killed in order to supposedly protect non native species such as cattle. 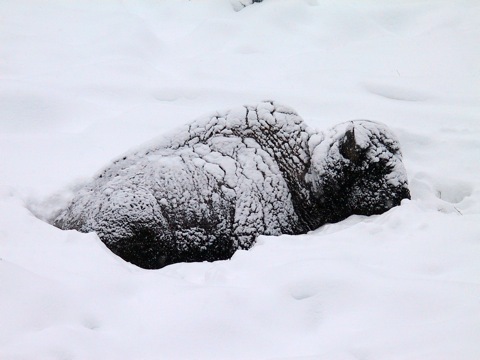 Matt Skoglund wrote a great piece on yellowstone bison. Yes the effects of emotion rather than science. Once again I can’t resist throwing gas on a fire. Mostly I hear bull about genetic pure when the herd was originally made up from 3 sources when wild cattle were common. They haven’t been free roaming in over 100 years they have been pen, fenced in, feed, and vaccinated. They’ve been hazed, herded and hauled, and that was the first 50 years. try reading this for starters then you can go back to the wailing and crying foul. Can’t start wailing yet because the link provided does not work. But I’ll take the bait by throwing a match into that gas. Perhaps for a boost we’ll have to import some of those non-native Canadian bison. First, when folks use the term “genetically pure” (which I don’t really care for either), they are referring to the fact that Yellowstone bison are the only herd managed by DOI that does not have introgression of cattle genes. This was determined by examination of mitochondrial DNA (see the NPS’s report here: http://wolves.files.wordpress.com/2010/11/bison_genetics_report.pdf). Thus, the herd are “pure” bison, as opposed to bison X cattle crosses. Second, I’m not sure what you mean when you suggest emotion, as opposed to science, is driving this debate? When people ask that bison be allowed to “roam free” they are asking for them to be treated like any other native species of wildlife. It seems to me that the broader debate here is about how wildlife should be managed by state and federal agencies? In any case–whether they roam free or are “penned” into YNP, science will be applicable and you can bet that it will remain an integral part of management. I knew I could count on you for some more info. Sorry about not double checking my type. The ‘Emotion’ line came from Ralph. It’s good that no matter which animal is discussed wolf references pop up. Have fun down playing a opposing view everyone. Emotion is what makes humans caring people, some of them anyways. If we didn’t have emotion, we wouldn’t have brought wolves back or fight for the animals that need our help against humans that wanna kill them. Science can be manipulated to suit a certain agenda. There are many agendas nowadays and a lot of people have one. Atleast with emotion, you know people are doing it because they care about something. if you search the website for the House Natural Resources Committee, you can see that Dr Kay for the last 15 years has always testified in favor of culling the herds of bison and elk in order to protect the “sacred cow.” Hmmm, just another scientist who knows where his bread is buttered and continues to put forth his opinion as opposed to actual science. for example, there is no scientific justification for allowing cattle to graze on arid or semi-arid public lands in the West due to the inherent carrying capacity of the land. Yet for decades, ranchers have become entrenched with their grazing leases which are disgustingly under-priced and subsequently subsidized by tax dollars (currently $1.35 per month per animal). It seems politics trumps all when it comes to land-use policy. – what is the actual number of bison that are INFECTED as opposed to possessing the antibodies due to exposure? – can bison possessing only the antibodies and not the disease infect cattle? – what is the ACTUAL number of cattle that develop the disease, and where were they raised, grazed and handled and by which ranchers? – in terms of $$, what is the percentage of livestock near Yellowstone (compared to livestock in the respective States not raised near Yellowstone) that is “at-risk” due to brucellosis infected bison, and are elk more of a danger in brucellosis transmission? Genetic integrity is important to conserve because it represents thousands of years of evolution in response to local environments. Through this process co-adapted gene complexes develop, which can become disrupted when hybridization occurs leading to a loss of fitness for generations of hybrid offspring. The Yellowstone bison represent the most important genetic resource for true ecological restoration of the species. For this reason, they must be protected from further harm caused by large-scale slaughters. Let’s hope the judge provides this protection through honoring the injunction motion.